A canter is controlled three-beat stepping performance by a horse. However, teaching your horse to canter from scratch may require several weeks or even months of practice. You need to watch out whether your horse can endure the training after looking at his age and strength. Remember that a young horse which is around 3 to 4 years might not accomplish this task but as his grows, he can canter. 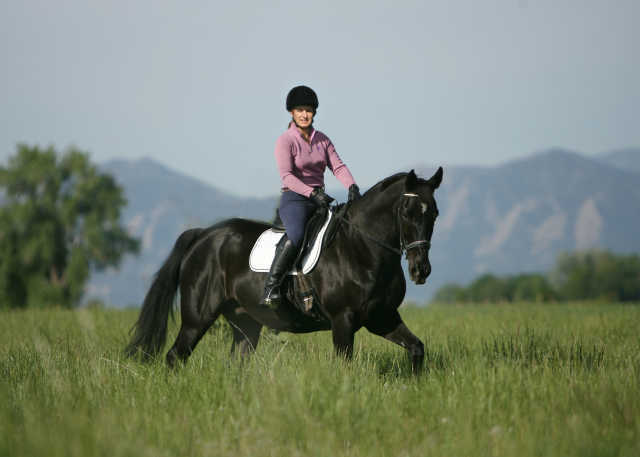 You can teach your horse to canter by trot-canter-trot exercise regularly. Charge your horse which is saddled and make him sprint in a round pen or an arena. You should start on the side in which your horse performs better. In most cases your horse will run simply but you need to let your horse canter with help of your voice, kisses, tongue clicks or even a touch of a crop. Let him canter for few paces before letting him trot again. Next you need to bridle and then ride on the horse. Perform the same exercises with your horse but maintain your balance on him. You should keep your horse in a small circle and should add less pressure. Remember that when the horse goes into canter mode, you need to roll your seat and press with the outside leg. You need to use few strides and should award your horse whenever he completes a canter or achieve his goal. Now you need to go to arena and continue the exercises. Remember that loose arms will let your body move in the momentum of your horse. You should use your voice and body command to guide your horse.